Vezi Acum Miraculous: Tales of Ladybug & Cat Noir S01E14 - Kung Food Online Subtitrat in romana calitate HD. Miraculous: Tales of Ladybug & Cat Noir S01E14 - Kung Food este un episod lansat pe 10 ianuarie 2016 super! Vezi acum online gratuit! Marinette’s uncle, the world-renowned Chinese chef Wang Cheng, visits Paris to participate in a cooking show called The Greatest Chef in the World. Before the competition begins, Marinette and Adrien run into Chloé, who is on the judges' panel. Chloé mocks Chef Cheng for being a foreigner, and in retaliation, Marinette fires back with her own insults. 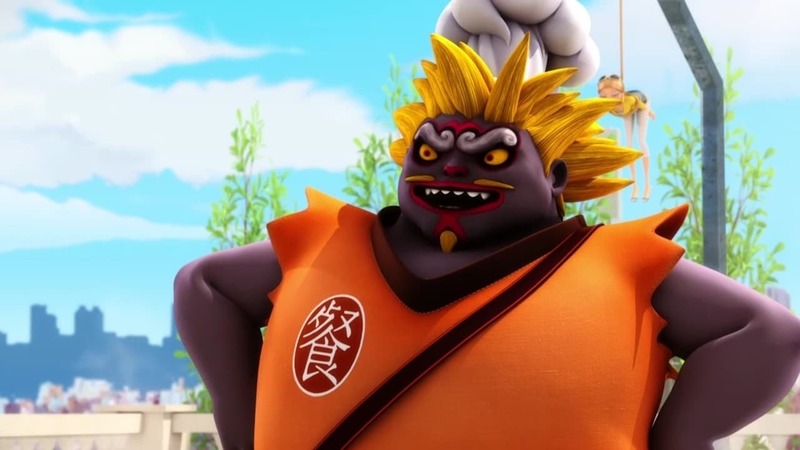 Chloé sabotages Chef Cheng’s famous Celestial Soup in anger, wanting revenge for Marinette's comebacks, causing Cheng to lose the competition, failing horribly. Confused and upset, Chef Cheng becomes influenced by Hawk Moth and turns into Kung Food, a villain enslaves those who had eaten his ruined soup and who plans to cook Chloé in soup. Distribuie sau scrie parerea ta despre episodul Miraculous: Tales of Ladybug & Cat Noir S01E14 - Kung Food.